Surely a mature Jacob Stockdale would at some future date cut a dash as the first president of a united Ireland. His piece of rugby magic in the second half sealed an epic win for Ireland. For a large chunk of Saturday, the people of Ireland, from Fair Head to Carnsore Point, from Malin to Mizen, and joined by Irish exiles in many places across the globe, parked woes such as Brexit and fretting about things like "hard borders", or indeed any kind of border. We all simply savoured a display of skill and flair, of enormous courage and passion, which saw Ireland's rugby team outplay and outwit the greatest rugby side in the world, the New Zealand All Blacks, for a first ever home win. Among the many delights on the day was the display by Jacob Stockdale and the leadership of captain Rory Best. Both are proud Ulster rugby players. They combined with our other heroes, such as Jonathan Sexton from Dublin via Kerry, Cork's Peter O'Mahony, Keith Earls from Moyross in Limerick, and Tadhg Furlong from Campile in south Wexford, to deliver a night of nights for all Irish sports lovers. There were tears of joy and whoops of celebration in every corner of the island of Ireland, and wherever else across the world the green was worn with inordinate pride. And for some fleeting moments, dreams such as 'President Stockdale', born of generous fellow-feeling - and never any sectional small-time politics - did not appear too far-fetched. In the end, all 22 players who graced the park at Lansdowne Road were heroes who deserve our undying gratitude. 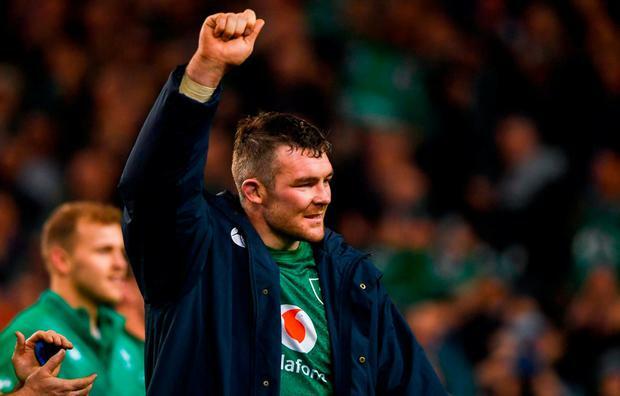 But without any doubt, Peter O'Mahony was the heroes' hero. That was epitomised by this newspaper's rugby writer, who gave all the Irish unusually high personal rankings, reflecting extraordinary performances. But Peter O'Mahony rated a most unusual but well-deserved 10 out of 10. All credit must also go to the team coach, Joe Schmidt, for his attention to every detail and his ingenious strategic skills. He is now rated the best coach in the world of international rugby - guiding a side which is rated the best rugby team on the planet. Let us all pause and savour that for a moment longer. It is some achievement for a small island where so many other games are also played with passion and commitment. Sport is a universal language which transcends language barriers, borders, and other obstacles to communication and accord between peoples. It puts the island of Ireland on the world map, bringing kudos which will be helpful in culture, commerce and other facets of international relations. This is a moment of pure joy helping us dream more generous dreams.